"So you've come to change my mind, My Lady?" A24 has debuted a new official US trailer for a court drama titled The Children Act, which premiered at the Toronto Film Festival last year. We posted the UK trailer for this a few weeks ago, now there's a new US trailer for another look. The film's title is a reference to a particular law in England: "When a court determines any question with respect to the upbringing of a child, the child's welfare shall be the court's paramount consideration." It stars Emma Thompson as an eminent high court judge, who is asked to rule on the case of Adam, a brilliant young boy who is refusing a life-saving blood transfusion on religious grounds. It's a complex dilemma especially for a judge to rule over. The film's cast includes Fionn Whitehead, Stanley Tucci, Ben Chaplin, Jason Watkins, Rosie Cavaliero, and Nikki Amuka-Bird. This looks very dramatic and emotional, certainly worth a watch for Thompson alone. You can also watch the original UK trailer for Eyre's The Children Act here, to see more footage from this. Fiona Maye is an eminent high court judge presiding over ethically complex cases. As the demands of her job cause her marriage to Jack to reach tipping point, Fiona is asked to rule on the case of Adam, a brilliant young boy who is refusing a life-saving blood transfusion on religious grounds. With her private life in turmoil, Fiona finds herself drawn into the case, taking the unorthodox step of halting proceedings in order to visit Adam in hospital. As the two form a profound connection and powerful emotions come to light, Fiona’s judgement is put to the test with momentous consequences as she must ultimately decide whether Adam lives or dies. The Children Act is directed by British filmmaker Richard Eyre, of the films The Ploughman's Lunch, Singleton's Pluck, Loose Connections, Iris, Stage Beauty, Notes on a Scandal, and The Other Man previously. The screenplay is written by Ian McEwan. This first premiered at the Toronto Film Festival last year. 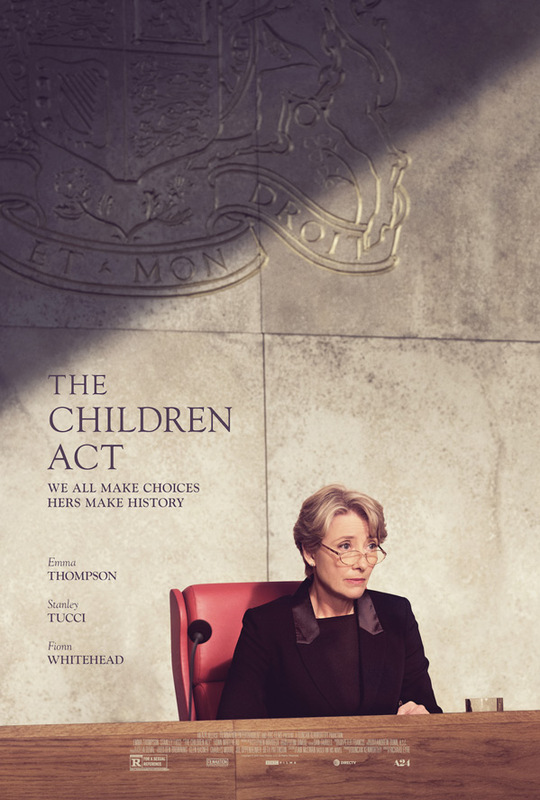 The Children Act will be release in UK cinemas first starting this August. A24 will then release the film in select US theaters starting September 14th this fall. Who's still interested in this?